Hey, nice that you´re here! Following, find all the infos and answers about my wedding bundles. You are puzzled what this is all about? Then do not hesitate to text me via the contact form. I am so excited to get to know you! Every couple I meet and every wedding I shoot are fundamentally different – and that´s btw what I really enjoy about my job. On this special and unique day every moment is important: starting with the getting ready shots and ending with the wedding party. Photos are actually the only medium that documents the wedding day and freezes all the special moments forever. Because of this I decided to only offer wedding bundles that last for at least 8 hours and therefore cover big parts of the wedding. If you didn´t think about having a photographer stalking you for such a long time I would really recommend you rethinking this. It´s really worth it and latest 10 years after the wedding you will be so happy for these additional wedding shots that document moments you probably forgot in the meanwhile. Following you find a detailed description of my services for full-day weddings. During the whole process planning your wedding I will always be by your side, providing you with advice and potential vendors that I made good experiences with. If you do not find what you are looking for just drop me a message, I am sure we find the right bundle for you! Before starting our journey together, it is essential to find out if we are a match. There is actually going to be no other person on your wedding that spends as much time with you as I will do. So you get the message, we should understand each other, laugh about similar things and just feel comfy in each others presence. Actually, if it feels like a friend would be taking your photos and you can just be who you are I achieved my overall goal and the most authentic and natural photos will be the logical result. Before the wedding you can also profit from my experience and knowledge about weddings that I could acquire during the last years. I am sure I can recommend you good vendors for your wedding. Additionally, you will also get an exclusive wedding guide in which I provide you with useful tips that help you during the planning process of your wedding. Included is for sure also the actual wedding coverage. You decide on the length of the coverage and also at which times on your day I should be taking photos. It is not necessary to decide on this right now, you can simply book me for 8h and later decide if you want to upgrade to another bundle. During the wedding day I keep myself in the background, hopefully talk a lot to your guest and thereby get part of the whole wedding party. It´s important for me that I am not simply another vendor on your wedding. I rather want to be like a friend to you and get as close as possible to every moment. Actually, it is after the wedding that the biggest part of work is waiting for me. I pick the best pictures from the thousands of pictures I take on the wedding day and edit them with my personal look. Of course, I put high emphasis on consistency and always make sure the pictures meet the requirements and style I present on my website. The amount of pictures I deliver depends on the bundle you choose. At 8 hours coverages you will get at least 350+ edited pictures and with every additional hour there are another 50 pictures. When I finished the editing process I will send you an individualized wooden box with some prints and a USB stick that stores all the pictures in full resolution. Moreover, I hand over the private rights of use so you can print and share the photos wherever you want. I am sure there will be some impatient relatives that want to see your wedding pictures as fast as possible. 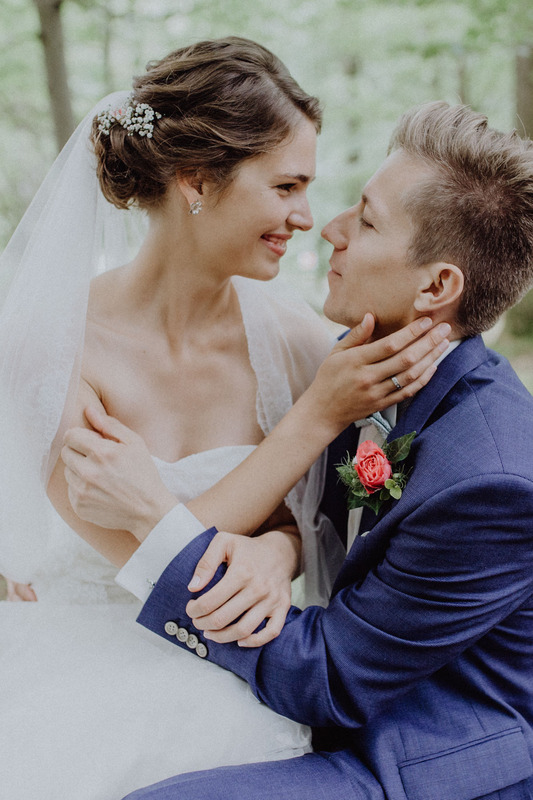 To make things easier for you, I provide you with a simple and beautiful wedding gallery that you can easily share with your family and friends via a short link. The gallery presents a best-of selection of your wedding photos and provides the opportunity to download the photos. In order to keep things simple I provide free travel and accommodation costs to all my couples in Germany. If you marry outside Germany no worries, I also provide attractive prices for destination weddings. As I love to travel, I am sure we can find a good deal. Is it possible to book you for weddings outside the Stuttgart area? And what about weddings abroad? Traveling is my passion and I love to discover new countries, people and cultures! That´s why I am traveling outside Stuttgart for many of my weddings. Travel costs are all included in Germany! If you have your wedding somewhere abroad I am more than happy to send you my special packages for destination weddings! I offer attractive prices for these kinds of weddings! Do we have to pay a deposit in advance of the wedding? In order to create some obligation I charge a deposit of 800 Euros before the wedding which will be later subtracted from the final billing amount. How long does it take you to edit and deliver our wedding photos? Usually, I manage to finish wedding pictures after approximately 3 weeks. However, especially in high season, when several weddings overlap, it can take 4 weeks. How long is the wedding online gallery available after the wedding? The wedding gallery will be online for at least 3 months so even your not so organized guests will hopefully manage to download the wedding photos. What happens when you get sick and can´t come to our wedding? Will there be another photographer? First of all I have to say that this actually never happened to me, even after almost 100 weddings I shot. But in the unrealistic case that I can really not come I will try everything to organize another photographer from my network that has a similar style and presents a good replacement for me. Do you edit all the photos? And what is actually included in the editing process? After the wedding the biggest part of work actually starts for me. From the thousands of pictures I will select the best ones and specifically edit these ones, as I will also deliver only the selection of photos to you. The editing process includes an adaptation of the colors of the pictures to my own style of editing. Photoshop retouching is not included as I do not want to manipulate your faces but show you just as you looked like on your wedding day. Do you prefer to shoot with available natural light or do you use flash all the time? I love an authentic, natural look and therefore use natural light most of the time on your wedding day. During the wedding party I have to use my flashes. However, even during this part I often also do lots of pictures capturing the natural light in order to show the atmosphere better. Can we also rent a photo booth with you? On your wedding day I exclusively want to concentrate on taking stunning photos of you and your wedding guests and all the unique moments. Being additionally responsible for a photo booth was more of a distraction for me in the past. That´s why I am only recommending photo booth rentals I made good experiences with. What equipment do you use and do you have a backup in case your camera breaks? I am shooting all my photos with a Canon 5d Mark 4 as well as some prime lenses, especially 35mm. And for sure, I also have a backup camera. Moreover, all pictures get stored on two memory cards in the same time in case one of them breaks or gets lost. Can we do the couple shoot at the actual wedding day? And how much time should we calculate for this shooting? In general, it is completely up to you and you can decide how important the couple shoot is for you. I often recommend my couples to do two smaller couple shoots on the wedding day. The advantage of this is that we can shoot at different locations and therefore achieve more variation. Moreover, the second shooting often takes place at golden hour, so when the light is most beautiful. What´s the resolution of the photos we will receive? You will get all the photos in full-resolution as JPEG files. Most of the pictures will be in 30 megapixels, so pretty big.